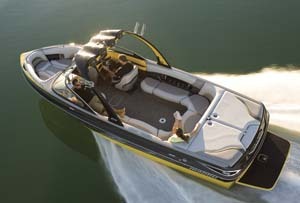 The well-known tow boat company creates a huge bow area in its Wakesetter 22 MXZ, by doing the obvious. 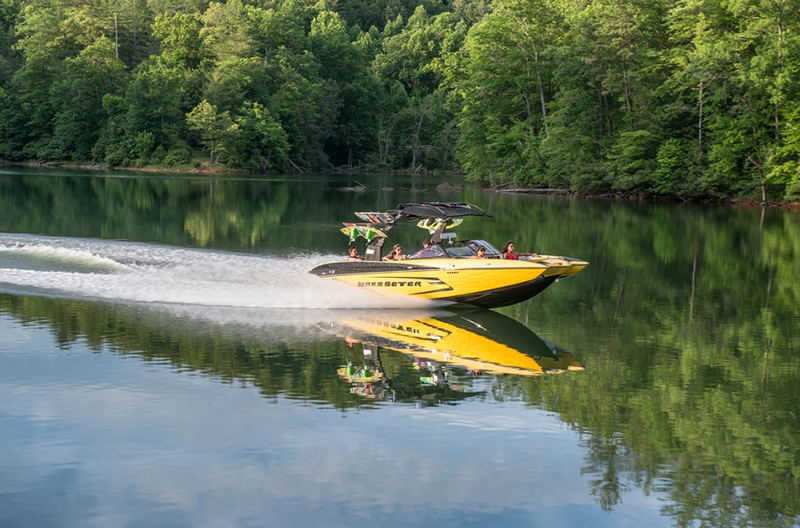 File this one under “why didn’t someone think of that before?” Malibu has just introduced the Wakesetter 22 MXZ, a great new wakeboard boat with a pickle-fork design that creates a wider bow section. 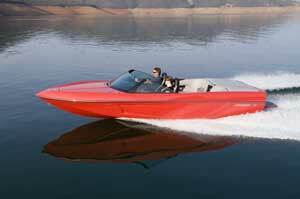 If you’ve been paying attention, you know lots of tow boat manufacturers are offering that design feature these days, in boats like the Moomba Mojo and the Tige RZ, but this one goes a step further. 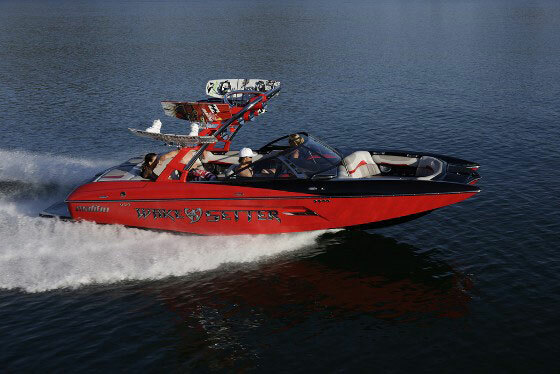 Malibu takes the pickle-fork design a step farther, with the Wakesetter 22 MXZ. Malibu moved the windshield farther aft to make the bow section longer. 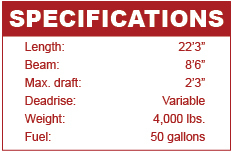 The result is likely the most spacious bow in the tow boat market. By any standard, it’s huge. Cushions are nice and wide, with gently angled backrests and wraparound bolsters. 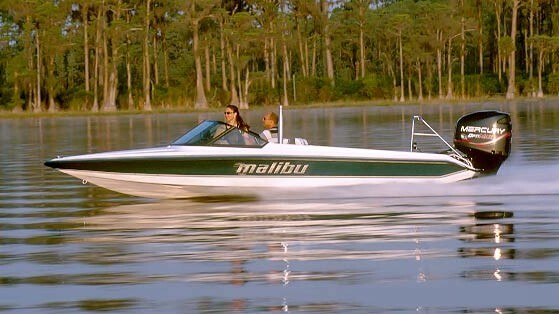 Malibu tucked the grabrails beneath the gunwale to preserve the sleek exterior lines of the boat, and concealed a boarding ladder under a nonskid-finished hatch on the center of the bow. 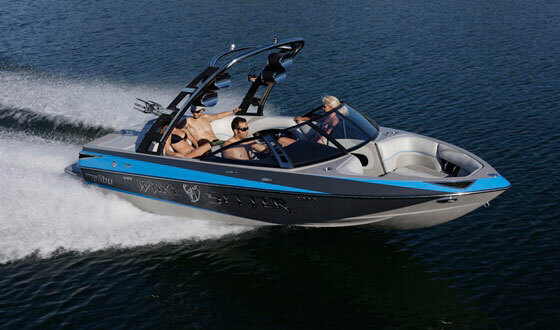 “The development of the 22MXZ is consistent with Malibu’s history of providing the ultimate mix of design options for the consumer,” said Adam McCall, Malibu’s vice president of product. Despite the bigger bow area, the MXZ’s cockpit is plenty roomy. It’s deep, too, with gunwales high enough to lend a secure feeling, particularly for families who bring little kids along. The cockpit sole is molded as one piece with the deck so the seat bases are all molded gelcoat for a smooth, finished look. 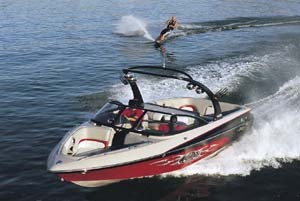 Thanks to the pushed-back windshield and pickle-fork bow on the Malibu Wakesetter 22MXZ, the bow area is increased—in fact, it’s one of the most spacious bows found on boats in this class. At the stern, the V-drive MXZ comes with side-opening hatches so the compartments are accessible from the cockpit or the swim platform. 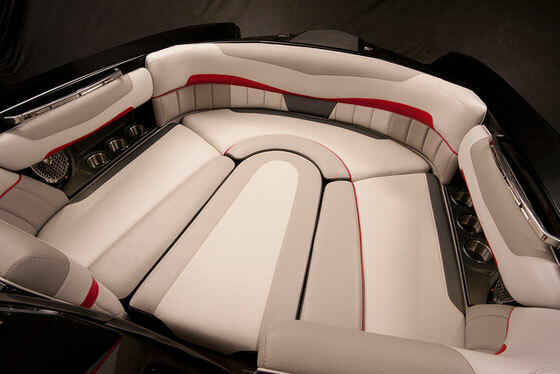 There’s a retractable tow pylon and rear-facing seats that provide a comfortable area for gearing up before a wakeboard session or ski run, and each seat has wet stowage underneath which can double as a cooler. The exterior also features a design cue that is subtle in its presentation, yet marks an achievement in its execution: the hullsides feature a recessed “gill” with a chrome accent that defines the midsection of the hull. It bears a slight resemblance to the heat-extracting fender vents behind the front wheels of a race or sports car. It might not seem like a big deal, but when you think about how an open-molded boat is built, the gills are no easy feat and demonstrate the amount of effort that went into the MXZ. This effort is also evident in the craftsmanship at the helm. The dashboard is swatched in French-stitched vinyl with thread that matches the accent color of the dash. Two analog gauges flank the optional MaliView display, with a stereo control head to the left of the never-gets-old one-spoke steering wheel. The throttle falls perfectly to hand, and is treated with a cross-drilled lever for an added measure of cool. The helm chair swivels and features a flip-up thigh bolster for increased visibility when docking or maneuvering around downed skiers. It’s even available with a seat heater. The MXZ can be rigged with a lot of options, a few of which probably ought to come standard, but two excellent features that do come on the base boat are the Illusion G3 tower and the MH2 frameless windshield. To call the windshield frameless is a bit of a misnomer. It does have a frame, but it’s subtle, with the frame rails treated in black and tucked behind the glass leaving a flush forward surface, save for the polished stainless uprights at each corner. 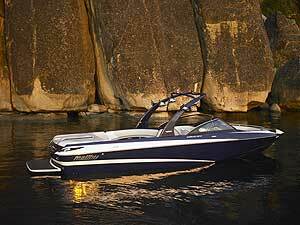 The idea of pushing the windshield back to create a bigger bow area seems so simple, yet it never occurred to anyone till Malibu did it with the Wakesetter 22 MXZ. It makes you wonder what took so long. For more information, visit Malibu.